Cable tray, introduced in the mid 1940s, is a safe and economical solution for supporting requirements of electric power, signal, control, instrumentation and communication cables. Fabricated in numerous styles (wiremesh, ladder, ventilated trough, channel, and solid-bottom) and sizes, cable tray provides the greatest versatility among cable support systems, while offering savings of up to 84 percent in labor costs. The Cable Tray Institute has several standards and guidelines for the construction, testing, performance, and installation of cable tray. Join the Cable Tray Institute today! 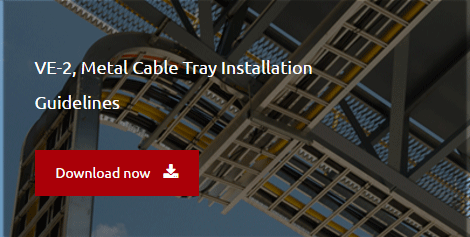 What is a Cable Tray System? Cable trays support cable the way that roadway bridges support traffic. A bridge is a structure that provides safe passage for traffic across open spans. Cable tray is the bridge that allows for safe transport of wires across open spans. What standards / guidelines are available for cable tray systems? and 800 cover various aspects of cable tray systems. documents to date: NEMA VE1, FG1 and VE2. information. Free download of this document is available on the NEMA website. NEMA FG1 addresses the standards for fiberglass cable tray systems. Free download of this document is available on the NEMA website. general installation practices. Free download of this document is available on the NEMA website. the advantages of using cable tray systems over other types of products. What types of Cable Tray are available? How do I know what type of cable tray is right for my application? Solid side rail protection and system strength with smooth radius fittings and a wide selection of materials and finishes. with intermediate to long support spans, 12 feet to 30 feet. Nonventilated continuous support for delicate cables with added cable protection available in metallic and fiberglass. to intermediate support spans of 5 feet to 12 feet. every 4 inches. Available in metal and nonmetallic materials. an economical support for cable drops and branch cable runs from the backbone cable tray system. standard widths of 3, 4, and 6 inches in metal systems and up to 8 inches in nonmetallic systems. frequency with short to medium support spans of 5 to 10 feet. primarily for low voltage, telecommunication and fiber optic cables. These systems are typically steel wire mesh, zinc plated. Single hung or wall mounted systems in single or multiple tiers. Standard widths are 6, 9, 12, 18, and 24 inches. Standard depths are 3, 4, and 6 inches. Standard lengths are 10 and 12 feet. fill, and speed to install are factors. What materials / finishes are available for the various cable tray systems? Hot Dip Galvanized After Fabrication: plain steel which is hot dipped after fabrication per ASTM A123. Class 1 Flame Rating and self-extinguishing requirements of ASTM D-635. Now that I know what types of cable trays are available, what configurations are available? Straight sections are available to route cables in a horizontal or vertical plane. these fittings are available in various radii and bend angles. Covers are accessories and shouldn’t be in here unless splices etc. are included. What support methods are available? especially useful when future cable additions are desired. Wall supports and underfloor supports are useful when ceiling structure is not available or undesired. Outdoor installations are controlled by the structures available to support the cable tray. What additional information do I need to supply to the cable tray manufacturer for them to best understand and satisfy my needs? NEMA VE 2-2013, Cable Tray Installation Guidelines, provides guidance on how to select cable tray. Question: Can mechanical utility piping or tubing containing water or compressed air be installed in cable trays with electrical cables? Answer: No. Cable trays are a support system for electrical cables, power, signal, and communication and optical fiber cables. NEC section 300.8 does not permit any tube, pipe, or equal for water, air gas, drainage, steam, or any service other than electrical in raceways or cable trays containing electrical conductors. Question: I am in the process of establishing guidelines for raised floors in communications facilities and plan to mandate that all cabling under raised floors be installed on an appropriate type cable tray. Are you aware of any industry standard that may mandate the use of cable trays under raised floors, particularly, power and signal cables? Answer: We are not aware of such industry standard, but cable trays offer significant advantages for this type of installation and in other computer, telecommunications, and power installations. The telecommunications industry is a very strong cable tray user. Question: We are using ladder type cable trays at many of our facilities for telecommunications wiring. Do you have any information available for recommended installation clearances for this type of cable tray? Answer: The NEC does not have a specific installation clearance, but indicates in section 392.6(H) that cable trays should be exposed and accessible. Telecommunications standard TIA/EIA-569 recommends a minimum of 12-inch access headroom above the cable tray. Question: Are there required code grounding practices regarding cable tray used only for telephone cable? A contractor has just installed a new phone system at my location and he utilized cable trays in the switch room. I did not see any deliberate attempt to ground the system. Our existing cable tray system is heavy bonded and grounded. If this is a code violation, could you refer me to the publication? Answer: Low energy systems may not be required to be grounded for shock or arcing, ut should be grounded for noise, lightening protection and electromagnetic interference. 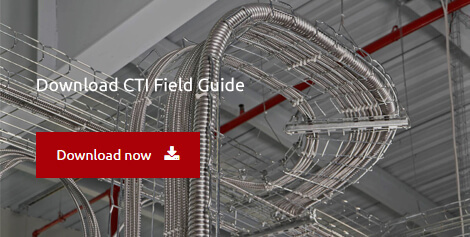 See CTI Technical Bulletin No. 15.and NEMA VE -2 section 4.7. Question: Are there any requirements for separation and segregation of various types of cables (i.e. Power, instrumentation, signal, telecommunications, etc.) in cable tray systems? Answer: Yes, there are NEC rules. Instrumentation, signal, and telecommunications cabling should be separated from power cabling. There are NEC requirements, but also for noise and electromagnetic pick-up from adjacent power cables. This can be accomplished by a separate cable tray system or by a divider within a cable tray. NEC section 392.6(E)indicates that multiconductor cables rated 600 volts or less are permitted in the same cable tray, however, separation of power and control cables is necessary as indicated in other sections of the NEC and for cross-talk noise reasons. NEC section 392.6(F) provides the criteria for cables rated over 600 volts. The types of cables usually used in cable trays are type TC (article336), PLTC (article 725), ITC (article 727), MC (article 336) and Communication Cables (800-52 (d)), MI (article 332). Fire Alarm Systems (article 760), Emergency Systems (article 700), Optical Fiber Cables (article 770) and Intrinsic Safety (section 504-30). The requirements in these sections are complex. We will discuss them in detail and the general noise problem in the next CableGram. The requirements for cables that have an outer metal armor are less than for plastic jacketed cables. The general rule is separate communication, control, signal, and instrumentation cabling from power cabling. Power cabling includes 460-volt motor power, 120-volt power, and lightening circuits. Note 120-volt circuits can generate noise. Generally, a separation of two inches is minimum, but the individual circuit and cable are the determining factors in separate requirements. Question: What types of cables can be installed in Cable Tray systems? and other cables, including those specially approved for installation in cable trays. Medium voltage (type MV) and single conductor cables in sizes 1/0 and larger are permitted with some restrictions in Industrial Establishments where qualified persons service the installation. Question: We have a customer who would like to install the majority of cable tray in his new industrial facility in what I call an “Edge-Wise” orientation. That is, each cable tray rung would point in a vertical direction as opposed to the usual horizontal direction. The local electrical inspector has stated that he has no issues with this as long as the manufacturer’s specifications have guidelines in how to install it this way. I have searched and can find no indication in any vendor’s literature that acknowledges the possibility that cable tray would ever be installed in this orientation. Answer: There is no NEC or other limitation on cable trays that would prevent the “Edge-Wise” orientation. The CTI needs to develop guidelines for this installation. This type of installation minimizes dust accumulation in dust locations and could be advantageous in other situations. Question: It appears that the NEC doesn’t address the maximum allowable fill area for a solid bottom, channel cable tray. It does however, address ventilated channel cable tray (Article 392.9(E)What is your opinion regarding the maximum fill area for solid bottom channel, given that multiconductor or signal cables only are installed? Answer: The CTI has submitted a proposal to amend the 2002NEC to provide this information. Question: Does the NEC apply to telecommunication cabling installations? Question: Is it necessary to provide tie-down cables installed in a cable tray? Answer: Yes; cables are tied down in cable trays to keep the cables in the cable tray, to maintain spacing between cables, or to segregate or confine certain types of cables to specific locations. The last two items can also be accomplished with a solid fixed barrier. The NEC in section 392.8(B)indicates that in other than horizontal runs, cables shall be securely fastened to transverse members of the cable trays. For vertical installations, the cables may hang away from the cable tray if not tied down. Although this section of the NEC does not require cable tie down in horizontal, it may be necessary to meet other requirements. For instance, it may be necessary and appropriate to space power cables at least a diameter apart to approximate the free air amperage rating of a cable. In hazardous dust locations (class II, division 2), it is required to space type MC and TC cables at least the larger cable diameter apart and arrange the cables in a single layer. Multiconductor power cables, 4/0 and larger, rated 2,000 volts or less, are required to be installed in a single layer by the NEC [Section392.9(A)(3)Tying down these cables is one way to insure this requirement. Where single conductor cables are installed it is highly desirable to tie the cables down to keep them in the tray. There are other situations where tying down the cables is important. The selection of the type of cable tie is also very important. For further information, see CTI Technical Bulletin No. 5, Tie Down Practices for Multiconductor Cables in Cable Trays. Question: Are Cable Trays listed? Answer: Metallic cable trays are not required to be listed because they are a support system. Metal cable trays can be U.L. classified with regard to suitability for use as an Equipment Grounding Conductor. Compliance with other appropriate NEC cable articles is required. CTI recommends compliance with National Electrical Manufacturers, NEMA, Standards Publications Nos. VE1 and VE2, and the manufacturer’s recommendations. Question: Are there cable fill requirements for cable trays? Answer: Yes — NEC Sections 392.9, .10, .11 and .12, and Tables 392.9, 392.9(F)) and392.10(A), describe the fill in terms of area and cable diameters. The key issue is ampacity. The ampacity criteria in article 392 is based on not exceeding these fill values. The number and type of conductors that can be installed in a cable tray is also limited by the weight of the cables and other load factors for the cable tray for a given load rated cable tray. See NEMA VE-1 and manufacturer’s data. Size the width of cable tray and the load rating for expansion and additions. Adding six inches to the width of a tray increases its price by approximately 10%. Question: Can high voltage cables be installed in cable trays? Question: Can a person walk on an installed Cable Tray System? Answer: No; walking on cable trays is not to be permitted. It violates the new version of NEMA standard VE-2, manufacturers marking and recommendations, and the intent of the NFPA70 Electrical Safety in Employee Work Practices. Walking on electrical equipment, conduits, cables or other electrical systems should also be avoided. In addition to the fall hazard, there is the risk of damage to equipment and possible contact with conductors.